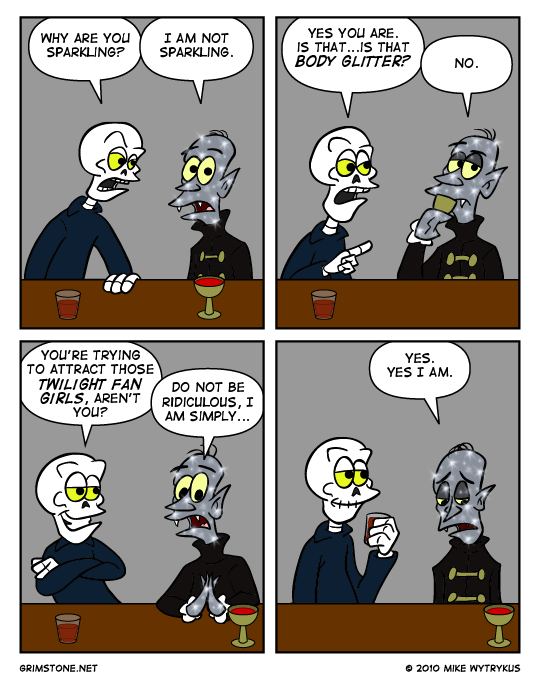 Grimstone is a comic strip that I have been writing and drawing on-and-off since the year 2000. It has always been an experiment to see what does and does not work in online comics, from both a creative and technical standpoint. The next step in that experiment is Patreon. The time of free Internet content subsidized by online advertising is coming to an end. A new age is beginning, one where creators are supported through crowd-funding and are directly compensated by their fans in exchange for rewards and bonus content. While I have been considering, even planning, to make the bulk of Grimstone's archive a patron-only reward, I've ultimately decided against it. Grimstone will remain free to read for everyone, from the oldest strips in the archive to the newest comics shared across social media. These new comics will be available at the Grimstone website as well as platforms like Tumblr, Instagram, and Webtoons. I only ask that if you enjoy reading Grimstone you consider pledging to this Patreon to help me continue making comics. Patrons at all reward levels will have early access to new comics published right here on Patreon before they appear anywhere else. You'll also receive exclusive content in the Patreon activity feed. Higher reward tiers unlock additional content including deluxe bonus comics, drawings from my sketchbook, and digital downloads of comic book issues and collections. Exactly how much new content I publish will be determined by the goals I've set up. The more patrons I receive, the more comics I will create. Be sure to read the free comics on the website, and please contribute to my Patreon if you like what you see and want more Grimstone in your life. With your help, perhaps I can finally earn a living from creating Grimstone comics full time. The town of Grimstone is home to many monsters, ghosts, and creatures of the night. One such monster is Ribcage, a skeleton who makes his "living" appearing in horror movies. His career has taken a turn for the worse and it has become increasingly harder for him to get work. Nevertheless, Ribcage is determined to do whatever it takes to become a star again, even if it kills him - again! Come and take a look at life through the eyes of a dead man.